I want to make a note of the fact that this is the second in a series but it stands fine on its own, up front, because I'd hate for anyone to miss out on the reading of Supergifted merely because they can't find a copy of the first book. Ungifted was the story of Donovan Curtis, an average boy who was accidentally sent to the Academy for Scholastic Distinction, where he met his friend Noah Youkilis. I missed reading Ungifted, but I've read Gordon Korman's writing, before (unfortunately, I didn't review Schooled, but I remember it well), and I had a feeling I wouldn't have any problem reading the second in a series by Korman. I was right. Korman nicely gives you just enough information to let you know what happened in Ungifted without totally giving away the plot. So, you never get that, "something's missing" sensation that you can get from series books that don't stand alone well, while reading Supergifted. Donovan's friend Noah is supergifted, with an extraordinarily high IQ. But, what Noah really wants more than anything, now that he's been kicked out of the Academy for Scholastic Distinction, is to fail. And, Donovan's school is definitely the right place for him to fail because it's normal. They do things Noah never would have imagined doing at the Academy. Not only does he want the opportunity to fail, but Noah likes a challenge. And, he's tremendously clumsy, so signing up to be a cheerleader will certainly challenge him. Donovan's worried about Noah, but he's even more worried about his brother-in-law's dog. She has bitten a child, in the past, and when Donovan moves to protect Noah from getting a beating from "Hashtag" Taggart, the dog takes a bite of his arm. When Noah decides he must fight Hashtag, Donovan follows. But, then something surprising happens and Donovan stops a freak accident from becoming a disastrous inferno. Nobody knows who the "Superkid" that saved the lives of head cheerleader Megan Mercury and her family is. But, when Noah steps forward to say that it was him, Donovan's half jealous and half worried. Noah is supergifted but not at lying. What if Noah tells the truth and Donovan's heroics are found out? Hashtag has told Donovan to stay away or the dog will be turned in as a menace. The farther the story of heroism goes, the more Noah is lauded as the Superkid, the worse things become. Will Noah give Donovan's secret away? Recommended - It took me a while to warm up to this story but there's a lot more to it than I mentioned in my way-to-long synopsis and once I got into it, I really enjoyed it. For example, Donovan's sister, her military husband, and their infant daughter are living with Donovan's family, so he has to deal with a crying baby and advice from a marine, in addition to school and concerns about his best friend. Donovan and Noah are in a robotics group at the Academy and something has gone wrong with their robot. And, Donovan has a puppy, which means loads of crazy puppy antics. 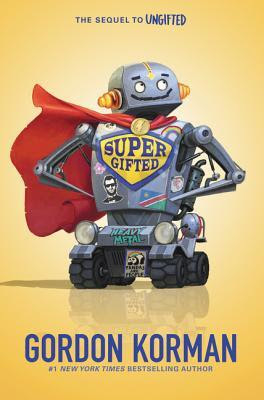 What's most important about Supergifted, though, is that Noah and Donovan are both terrific kids who mean well. And, the book will definitely make you or the middle reader in your life smile. Gordon Korman's first book, which he wrote at 14 or 15, came out when I was in grade 5. This Can't Be Happening at MacDonald Hall is a brilliant funny book. I'm so pleased to see he is still writing children/middle school books. His books remind me of my childhood. Both of the books I've read by Korman were funny. Schooled is more laugh-out-loud funny than Supergifted, but the farther you get into Supergifted, the more clever it becomes. I loved that. I had no idea he'd published at such a young age!